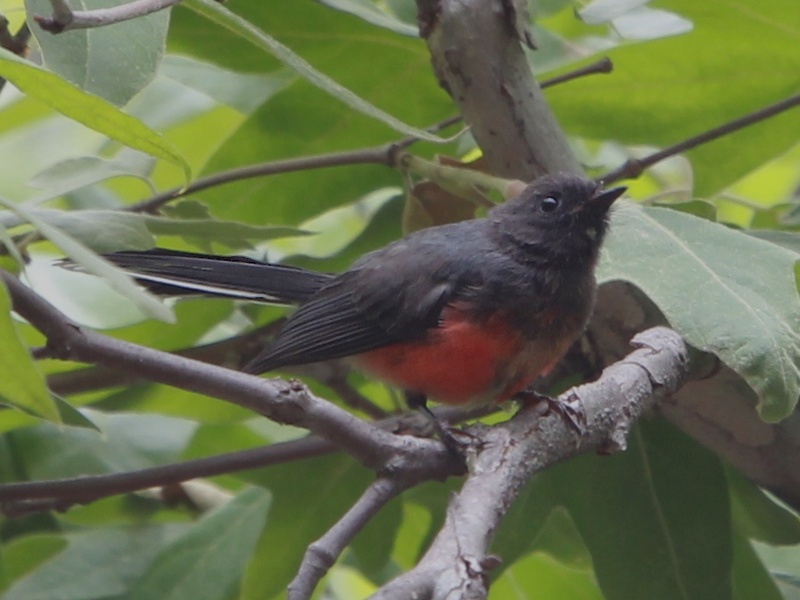 On July 24, Melody Kehl found an ABA Code 4 Slate-throated Redstart at Huachuca Canyon, on Fort Huachuca near Sierra Vista, Cochise County, Arizona. Photo by Laurens Halsey, used with permission. More photos available at the link. The main gate of Fort Huachuca is located off of Hwy 90 at Sierra Vista, Arizona. From the gate, bear right onto Squier Avenue, then right onto Winrow Rd. Then turn left onto Christy Ave, which eventually becomes Hines Rd and then Huachuca Canyon Rd. The bird was originally reported about 0.6 mile above the 1.7 mile picnic area, 70 yards above the concrete dam, just above the native rock and concrete dam. Note that Fort Huachuca has traditionally been open to the public during daylight hours, but security concerns have tightened access requirements. Civilian visitors who are U.S. citizens must provide photo identification, vehicle registration and/or car rental contract, and proof of insurance. Foreign nationals are allowed to visit only in the company of a U.S. citizen with a military identification card. Additionally, all or parts of the post may be closed to civilians for indefinite periods of time for reasons of public safety and/or national security. All visitors are subject to random inspections by military police. Slate-throated Redstart is a common, variable, and widespread neotropical species ranging from northern Mexico south to southern Bolivia. The subspecies from northern Mexico has red on its breast and belly. In Guatemala the red is replaced by orange-red underparts grading to yellow in Panama south (Warblers, Dunn and Garrett). Records of this species in the ABA Area are mostly from Southeast Arizona and Texas. There is one additional record from New Mexico. (ABA Checklist, Pranty et al.). UPDATE 7/29: The redstart has been present daily as of 7/29, but Huachuca Canyon is closed until further notice due to bear activity.